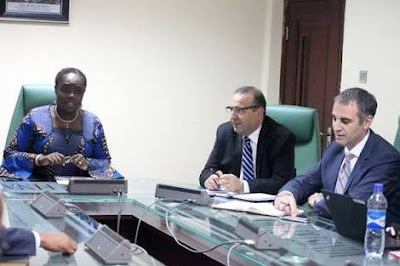 Minister of Finance, Kemi Adeosun, on Monday held a meeting with officials from the International Monetary Fund (IMF) and Debt Management Office (DMO). This is Adeosun’s first public appearance since news broke that she allegedly forged her NYSC exemption certificate. In a terse statement signed by NYSC’s Director of Press and Public Relations, Mrs Adenike Adeyemi, the Scheme said available records indicate that Adeosun did apply for an Exemption Certificate. NYSC is, however, yet to disclose whether the Minister was issued with an Exemption Certificate in response to her application.